Perhaps a better title would have been "Always Winter, Never Christmas", seeing how the revived River Song (formerly known as Doctor Who) has an almost pathological obsession with thinking Christmas is in no way/shape/manner of sort even close to a religious holiday (hence the constant referrals to 'winter solstice' rather than Christmas). After all, it wasn't until A Christmas Carol that we had even a small suggestion that the evening of December 24-25 somehow had anything to do with something called a "Jesus" (at that was when the carol Silent Night was being sung by those aboard the doomed ship). I can't truly fault people like Stephen Moffat for that: they, I imagine, live in a society that doesn't want to offend the Richard Dawkinses of the world by putting anything remotely theistic in their programs (even if it means being disingenuous with the actual 'reason for the season' as it were). However, you can't call a Christmas/Winter Solstice River Song episode The Doctor, The Widow, and the Wardrobe without evoking memories of the C.S. Lewis story The Lion, The Witch, and the Wardrobe (a Christian allegory if ever there was one). Now, Lewis' story does have a Christmas tie-in (Father Christmas himself pops up), but how Lewis himself, the Granddaddy of Christian Apologists, would react to all this 'winter solstice' business I can only guess (but I'm guessing he would take a rather dim view of it). The Doctor, The Widow, and the Wardrobe is meant to have us think of Lewis because the story is almost shameless in its taking of certain elements. If one knows the Lewis story, you get some idea of what DWW is. That in itself isn't bad. However, the Winter Solstice Special is to my mind, wearing out its Yuletide welcome. It is Christmas, 1938. The Doctor (Matt Smith) has just blown up a spaceship and managed to escape but in his rush got his spacesuit on backwards. Onto Earth he crashes, to be found by Madge Arwell (Claire Skinner). 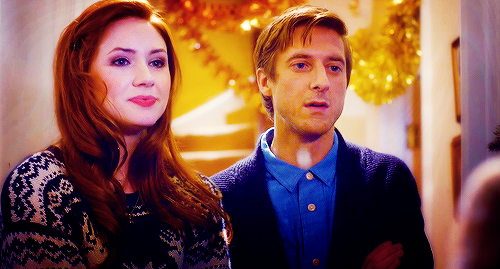 She leads him to the TARDIS, and a grateful Doctor promises he will repay this kindness. It is three years later, and a war is going on. Madge's husband Reg (Alexander Armstrong) is an RAF pilot, but alas, Madge learns that on the 20th of December, 1941, her husband was lost at sea. She decides to keep this news from her children Cyril (Maurice Cole) and Lily (Holly Earl) so as to not spoil their Winter Solstice. She decides that they need to get away from the bombs, so it's off to a dilapidated home in the country, where the Caretaker ends up being...the Doctor. He has set up a veritable wonderland for the children to celebrate the equinox (formerly known as the birth of Christ), but Madge finds him hopelessly irritating, saying that she finds the man "quite ridiculous". In any case, the Doctor has prepared a special box that is not to be opened until Christmas, but Cyril, being hopelessly curious, opens it. 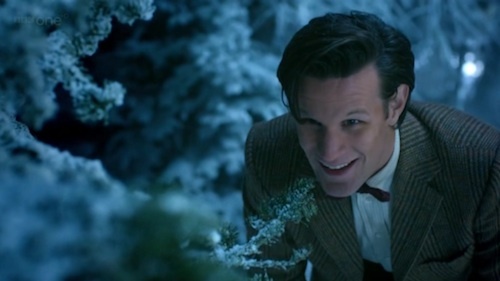 This blue box, all wrapped like a giant Winter Solstice present, allows him entrance into a fantastical world where it is literally always winter and never Christmas. However, something is dangerously off: the trees have a life of their own. Quite literally: the trees are alive, and they're looking for a host. The Doctor and Lily (whom I kept thinking was called Lucy, but I digress), follow Cyril to rescue him, as does Madge. The Doctor and Lily come across a Dark Tower (with a lion's face as a doorknocker) where they find Cyril virtually held hostage. Madge, meanwhile, finds three Harvest Rangers who inform her this forest is to be melted for fuel via acid rain. We learn that these trees, the Androzani trees, are seeking to escape before the rains, and they look first at Cyril as a vehicle, but he won't do. Lily is a slightly better candidate, but in the end, it is Madge who will be the literal mother-ship. As they fly off through the time vortex, with the spirit of the trees within Madge, she is forced to see her life relived, including the death of Reg. Once the Androzani trees are deposited safely somewhere, we return to Christmas, 1941. Curiously, while watching The Doctor, The Widow, and the Wardrobe, I thought just how awful it was that Reg should live. It isn't that I wanted him to die, it's just that Steven Moffat's story would have been both predictable and a bit of a cheat if he'd been allowed to return, safe and sound, unaware of how his wife brought him home. For the longest time I struggled about how this non-twist would affect my grade for The Doctor, The Widow, and the Wardrobe. On the one hand, it IS a happy ending, and one doesn't like arguing against them. On the other, I found that in my notes I actually wrote, "No, No-he didn't come back". I'll leave aside for a moment what appears almost a casual dismissing of so many widows and widowers and orphans who won't have the Doctor to bring back their parents from war, and instead think about how this situation isn't all that unexpected. Would I think that the widow in a story called The Doctor, The Widow, and the Wardrobe should have remained a widow? Well, a lesson could be given about how in times of war, one has to accept that perhaps people die and as much as one might want them back, they just cannot do so. There were, however, other elements that brought DWW down for me. First is the opening that has the Doctor blowing up a ship and flying out into space while trying to slip on a spacesuit in outer space. Again, I won't focus on the logic (or lack thereof) of this: after all, we are dealing with the Doctor. Perhaps it is because I have been in the midst of a James Bond retrospective, but the entire opening sequence reminded me of a pre-title Bond film scene (something that is barely related to the overall plot). Further on the points of logic, this is suppose to be 1938 (given that it is three years later, the United Kingdom is at war, and Reg is reading a newspaper that says "War is Imminent"). I can say that despite the headlines, war was not officially declared for another nine months, so it was still a ways off. What did bother me was that Madge, middle-class housewife 1938, knows what a helmet is and doesn't appear a bit fazed at seeing a man in a spacesuit going out and about. Granted, she did think he might be an angel, but I couldn't shake the idea that they were stretching the point of believability. Having him have the helmet on backwards, something played for laughs, did not help. I know it was so that Madge wouldn't recognize the Doctor off the bat when he came roaring back as the manic and goofy Caretaker, but I couldn't get into how jokey a lot of DWW was. The entire tour the Doctor gave them made the Time Lord look downright bonkers, and Smith's interpretation of the Doctor is really beginning to grate on me. At first, I thought we needed some levity after how morose David Tennant had been in his final episodes, but now I don't think I can defend him as much or as well as I used to. He now is slipping into parody, given to run around and move as if he no longer was in control of his body. For all the originality DWW tries for (apart from drawing on C.S. Lewis), some of Moffat's lines evoked other stories. When one of the Rangers tells the other "There's no crying in military engagements", perhaps because I'm an American, I couldn't help thinking to one of the most memorable lines in American film (as voted by the American Film Institute): from A League of Their Own, "There's no crying in baseball". The environmental message in DWW reminded me of both The Lorax (I speak for the trees) and even Lewis' best friend/spiritual mentor J.R.R. Tolkien. Seeing those trees, ancient and wise, fighting for life made me wonder if Treebeard and the Ents were going to go after the harvesters and lay siege to their stronghold (wherever it might be). Somehow, the idea of preserving the trees IS a positive message that doesn't crowd out the overall story, so much so that I wasn't bothered by it. I suspect but cannot prove that a message was sent about the importance of saving the forests was in there. However, I won't begrudge them that. I also won't begrudge a good performance by Skinner as the Widow Arwell. She brought both the sadness of loss and the false front for the children, making her forced recognition of her loss all the more sad (and her determination to save the children all the more compelling). What I found in The Doctor, The Widow, and the Wardrobe is that one might be tempted to think well of the story if one has no knowledge of the C.S. Lewis story it draws inspiration from. However, the trees escaping weren't interesting, having Mr. and Mrs. WILLIAMS pop up just seems a quick way to get them into the story a la Closing Time, and despite the best efforts, I don't have any interest in opening this box again.